Oh jeez hasn't it been proven he didn't reach over the wall and most agree Alou wouldn't have gotten the ball anyway? It was inches from Alou's glove, unless it were to pop out he was going to make the catch. Tony Tarasco was likewise going to catch the ball Jeffrey Meier pulled away from him. Just going by what Alou thought, after he'd had a few years to calm down. Everywhere I play, even now, people still yell, 'Bartman! Bartman!' I feel really bad for the kid," Alou told Associated Press columnist Jim Litke. "You know what the funny thing is?" he added a moment later. "I wouldn't have caught it, anyway." From everything I've ever seen, Bartman reached over the rail and interfered with a catchable ball. Am I missing something? I think he was just saying that to make the kid feel better. It was headed into his glove. I get your sentiment but he was surrounded and outnumbered by about 47.000 people. Not everyone was getting on him about it. And you usually only need to stand up for yourself to shut them the freak up. And it's not like he would've had to fight all of them. One is usually enough to get the rest to calm the freak down because most people don't really want to mix it up. Like Christie at the Brewers' game? I gotta run. The Chief is lurking. Seems weird to me but eh. Here is a good take on it. I wear bi-focals, so I wouldn't have reached for the ball, because it would have hit me in the face. But I get his point: most fans would have reached for the ball. Like Christie at the Brewers' game? Most of the people in that section were reaching for the ball. I think he was ready to mix it up. Is this ring identical to a real championship ring? Or some kind of one-off? I think it's identical, it is has his name on it lol I'd sell that sucker so fast! No. 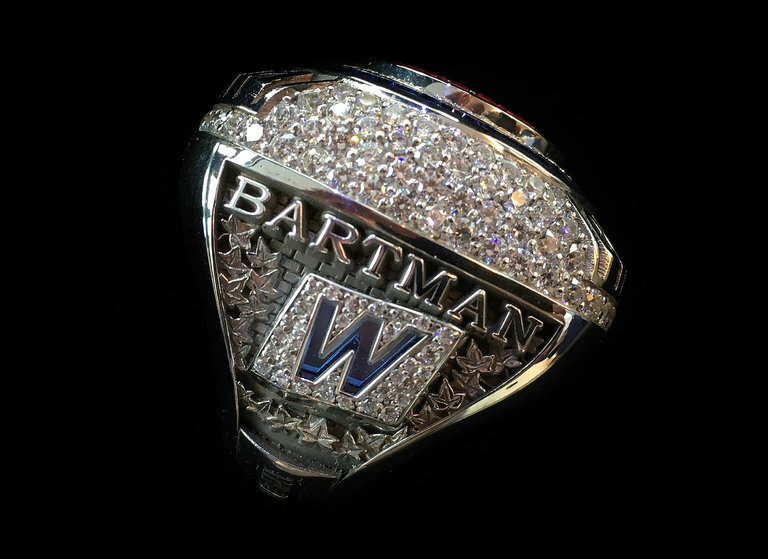 Stadium employees and such that get rings get a different version and that, I believe, is the version that Bartman got. They also have to sign an agreement that if they ever feel the need to sell it, they have to sell it back to the team. No. Stadium employees and such that get rings get a different version and that, I believe, is the version that Bartman got. In my experience, this is not true, but I think every team is different. ...and if he was 6'6" 240#, he would have caught the ball and nobody would have dared give him crap. Wouldn't have kept the Cubs shortstop from missing the ground ball that was hit right at him. This guy lost +/- 14 years of his life for this. He was a nice, quiet guy who coached little league and loves his Cubbies. He deserves more than a ring...they should ask him to throw out the first pitch at the first playoff game this year, and give him mitlen and Spider type seats for the game. And he can flip the bird to Cubs Nation for all I care. They asked him to come during the series last year and he declined. He doesn't want the publicity. I read that over the years, the Cubs have made overtures. He declined. I still don't think he will come. Traumatized for life by some low life fans. He ain't good lookin' enough to sit with me and spider. I think them winning it all finally has made the difference, why would he want to come last year and if they lost people would dredge up "Bartman cursed us again!" It absolutely sucked the toll that took on this poor guy's life but it does seem in accepting the ring and issuing that very gracious statement that he is ready to openly be a Cubbie fan again.